There is "no new credible evidence of criminality" in files from an east London borough, to suspect fraud, the Metropolitan Police has said. It follows claims broadcast on the BBC's Panorama that grants were made to charities in return for electoral support in Tower Hamlets. Three files of material were handed to the police by the Department of Communities and Local Government. The Met said there would be no new investigation into the files. However the Met said there was an continuing investigation by police into alleged irregularity concerning money awarded by Tower Hamlets Council to an organisation within the borough. Panorama had alleged the council, run by directly-elected mayor Lutfur Rahman, had diverted £3.6m of grants to Bangladeshi and Somali-run charities in return for political support. A Scotland Yard spokesman said the files had been reviewed by a team of officers over the past six days. It said: "In addition, officers have liaised with Pricewaterhouse Coopers LLP (PWC) who are conducting a full and wide-ranging audit of financial matters at The London Borough of Tower Hamlets." 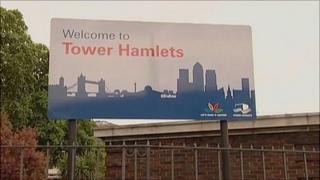 Tower Hamlets Council insisted it had "seen no evidence" that its processes had been run inappropriately. A spokesman for the council said: "The news from the Metropolitan Police is to be welcomed and Tower Hamlets will continue to work with the auditors and DCLG." Panorama had said it found Bangladeshi-born Mr Rahman had more than doubled funding recommended by officers for Bengali-run charities. In a statement, it said: "We continue to stand by the programme's findings which uncovered serious concerns about the use of public money, which are still being investigated by the government. "Our programme did not say there was evidence of criminality." The inspection by PWC is continuing to look into the authority's payment of grants, the transfer of property, spending decisions in relation to publicity, and other contractual processes, from 25 October 2010. It has been asked to report back to Communities and Local Government Secretary Eric Pickles by 30 June. The Met Police said before the three files were handed to officers a report concerning irregularity was made to police by Tower Hamlets Council on 20 March. Tower Hamlets Criminal Investigation Department is currently investigating irregularity concerning money awarded to the Brady Youth Forum in January and April 2013, which was identified in an internal review by the council. There are elections in London on 22 May, including for the directly-elected Mayor of Tower Hamlets. A list of candidates will be published after the close of nominations next week.